Hello! 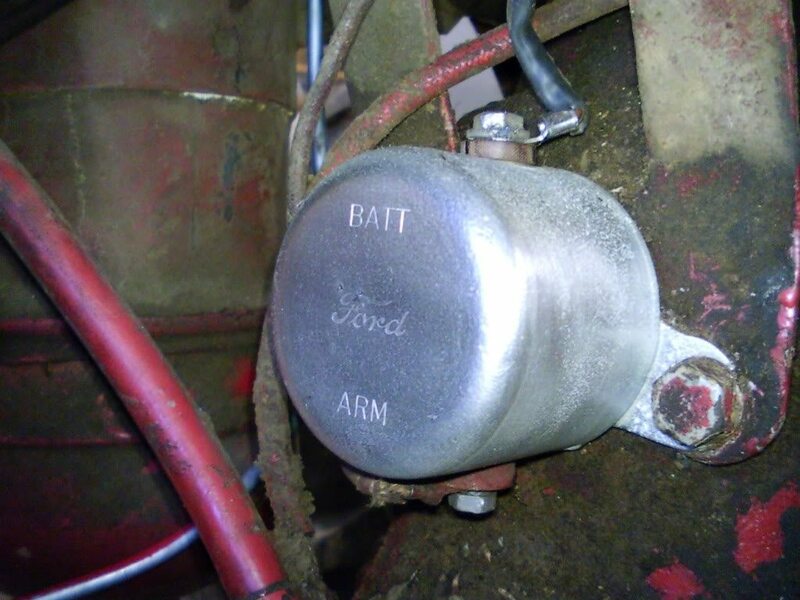 I am an ag teacher and my students are restoring a 1942 Ford 9N. My students are having a lot of trouble wiring the battery for the 6 volt. We are not looking to convert for show purposes. Does anyone have a video or anything that can help? 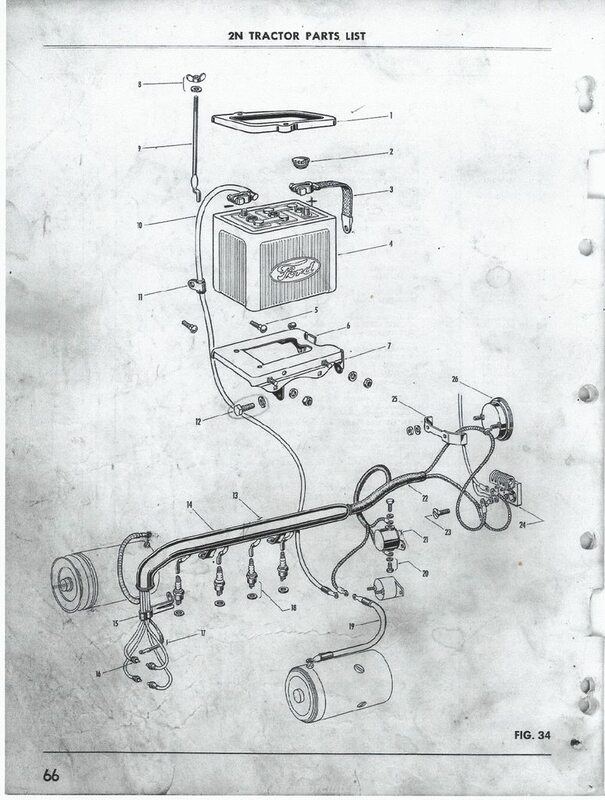 I have only found a few schematics but we are still having some problems. Anyone have any ideas? I don't want to have to convert it as it will hurt them in the show ring. Thank you. Alcornag, Google "Wiring diagrams by JMOR" Diagram will identical to 9N wiring. Besides what HCooke said, the ground strap goes from the positive post to a bolt on the steering column and the negative cable goes from the negative post to the starter switch. Be sure to use the large gauge (small number) battery cable for 6 volt systems. Start with the essential correct manuals. 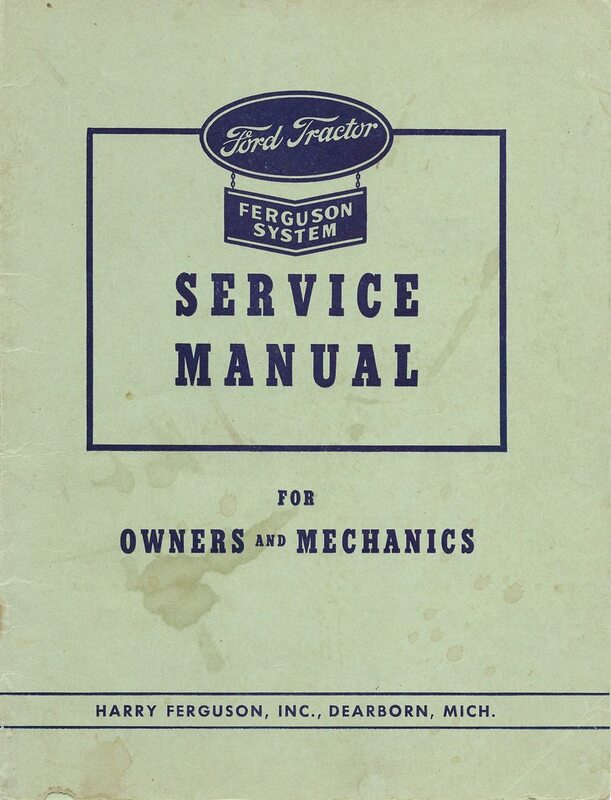 The I&T FO-4 manual and the 9N/2N SERVICE MANUAL are good to begin with. You can get a free download of the latter at the NTC site, in the 'manuals' forum. 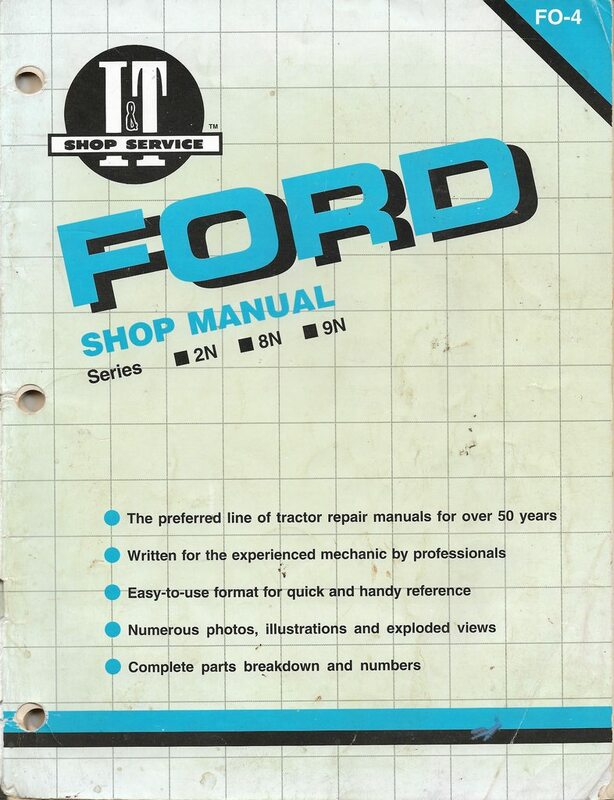 OEM FORD electrical systems were 6V/POS GRN setups. Here is what you should have: Front Mount distributor; points set at .015"; 6V square-can coil; Champion H12 or AUTO-LITE 437 sparkplugs gapped at .026"; and the 9N after s/n 12500 and all 2N's used a 1-Wire/3-Brush generator; the round-can cutout; OEM Ballast resistor; OEM Neutral Safety Starter Pushbutton Switch (by shifter); an AMMETER; an Ignition Key Switch; 1-Wire starter with NO solenoid; and a good GP1 6V AG type battery. Verify wiring is correct before turning over and you can polarize generator by arc-sparking the two cutout terminals; BAT & ARM with ha pair of plier handles. Like to see your progress,pictures as you rebuilt it, we love photos. 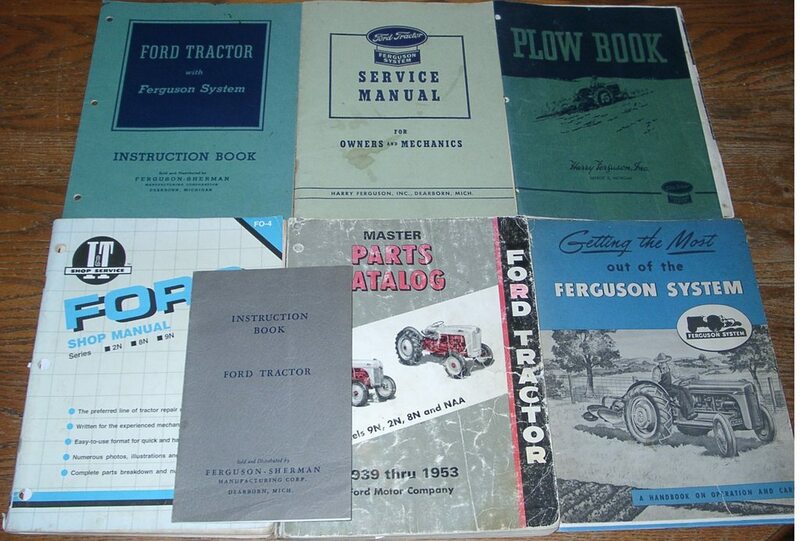 Make certain that you and the students understand that your tractor has a positive ground system. In other words connect the Postive post on the Battery to the ground spot on the tractor. (The Dash) The negative post runs the Electrical system on the tractor. I am not an expert but no one else seems to mention this. And you said your students are having trouble with the Battery hook up. 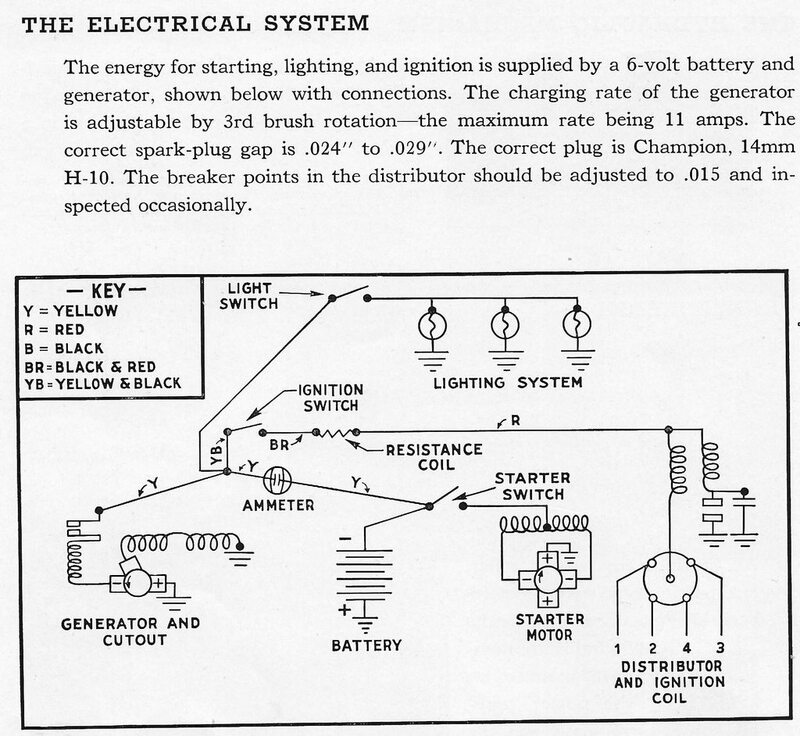 You can Google JMOR wiring diagrams and use the appropriate schematic. Yeah, I did mention the OEM setup was 6V/POS GRN if you read my post thoroughly. BUT, it doesn't HAVE to be, it just works best with a positive ground. Some fellas even slap a 12V battery in with no other changes and it will run fine -starter motors don't care if 6V or 12V. Polarize the generator for whatever is used. 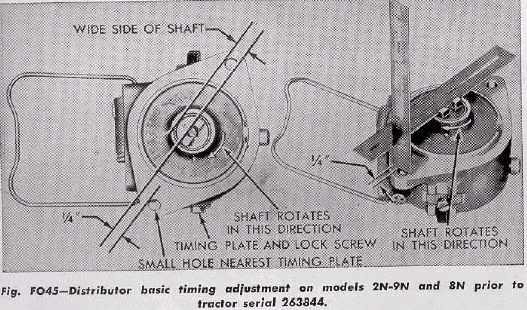 It's all in the correct wiring/components and having the distributor set right. The OEM diagrams I posted are pretty straight forward. 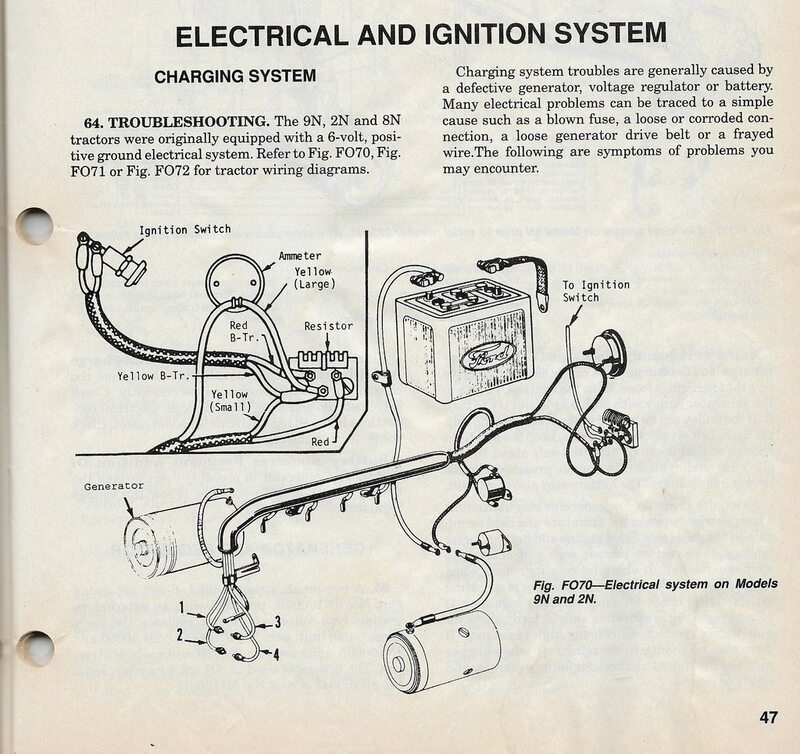 Once again, you and your students can get all the information required on these old N's in the original Owner/Operator/Parts/Service Manuals, the I&T FO-4 manuals, and JMOR's wiring pictograms. The MPC's will show exploded views (see picture) and list all the parts and the others will have wiring schematics and diagrams to further assist. All the original MPC's are available for free download at the NTC site. 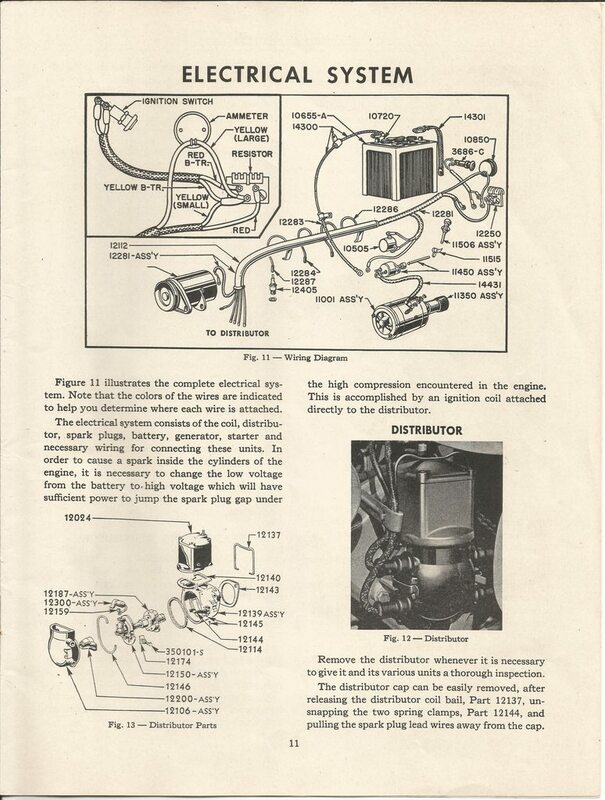 The 39-53 MPC and the I&T FO-4 Manual can be found in new reprinted copies at just about every parts supplier -try just 8n's -but prices vary so shop around. Timing the front mount distributor is very critical so start there. I'm fine. Thank you for asking. I just did an MF 20 dual clutch on a tractor I bought from our school district. Been really busy with our school program and working with Toyota to become a training site. I'm usually here. I learn a lot by reading. The above drawings show two Resisters in the power line to the Coil, My 9n has been using coils and I want to install an additional resister in the power line to the coil, can you tell me what resister I should obtain for this. Take photo's of everything on your tractor now, in particular take photo of inside of Distributor where the points are located, at the top of the distributer you will see a Brass bolt that the Coil spring sets on. It is critical that you use a Plastic insulator here so that the brass connector from the points and the Condenser which are connected here do not touch the body of the Distributor. (quoted from post at 08:34:08 01/11/19) The above drawings show two Resisters in the power line to the Coil, My 9n has been using coils and I want to install an additional resister in the power line to the coil, can you tell me what resister I should obtain for this. as I'm sure you have read before, if such a second resistor is needed, it's value is determined by subtracting the combined resistance of coil primary plus current resistor from 3. Or, adjusting total resistance to achieve a steady state current of 4 amperes. (quoted from post at 08:45:35 01/11/19) Take photo's of everything on your tractor now, in particular take photo of inside of Distributor where the points are located, at the top of the distributer you will see a Brass bolt that the Coil spring sets on. It is critical that you use a Plastic insulator here so that the brass connector from the points and the Condenser which are connected here do not touch the body of the Distributor. "chital that you use plastic insulator" ? Where does such come from?! The oem Ford distributor has no such thing!